I went out to the group campground where three brothers and a nephew, with their families, were roughing it in their big new 5th wheels. All of them have Quads, including the kids. 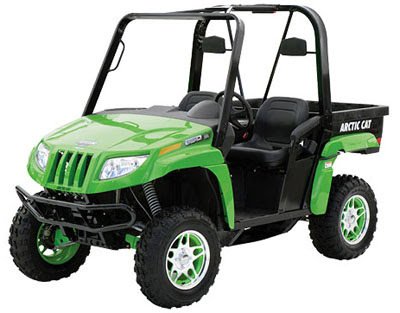 My youngest brother just got this marvelous Arctic Cat Prowler, with the cover over the roll bars. Oh what fun to go blasting thru the woods, along trails that have more pot holes, dips and mud puddles than I've ever seen, but I was safely seat-belted in and loved it. The best part was surfing thru the river....with the excuse of "washing" the mud off. At first my brother played it "safe" and went thru the shallow part, thinking I'd freak out...um...no, I wanted to go thru the deeper part, where the water came over the floor and wet our feet...now, that's fun!! haha! Yeah, it IS fun! I much prefer those to quads, as they have a regular steering wheel and they're fun to drive like a golf cart!